When you order an inflatable spa bath, you get all the accessories you need to set it up, run it and store it. There are always things which you can add on or into the spa baths to enhance your experience but the basic elements are all there. 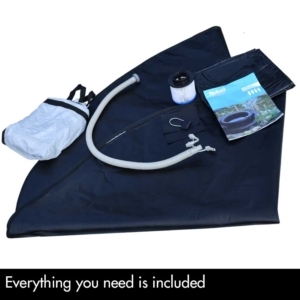 The accessories that are included in the spa package are a filter, inflation hose, insulation lid, lockable lid, lock, bag for you to pack up the spa and store it in and the manual. You can order your hot tub (including cover etc) in Melbourne, Sydney, Perth, Cairns, Adelaide, Gold Coast, Brisbane, Darwin and Australia wide. Filter – This is one of the most important pieces in the system. Whenever you have a body of water where people bath in which isn’t drained regularly, you need to have a filter. This keeps filtering the water of impurities and helps regulates it. The filter provided comes with a manufacturer’s warranty of 12 months for mechanical or product defects (wear and tear is not included). Inflation hose – you need to get the air in somehow right! This can be connected to a pump which can help you set up the whole system in approximately 5 minutes. This is a durable, long-life hose also covered by the manufacturer’s warranty for defects. Lockable lid – one of the key features of this package is the lockable lid. This can help keep the kids out of the spa bath when needed and also provide protection for the water if operating outside. Bag – this is for when you need transport or store the hot tub. You can fold it down and put it in the carry bag. It can be useful if you are taking it with you on an adventure or moving houses. If you decide to replace any of the included accessories you can purchase them here at competitive prices with free delivery on all the products we send out. So, you can get your filters, covers, bags, even your organic solution kits sent out free of charge for your small round hot tubs and spa baths in Gold Coast and Brisbane, Cairns, Perth, Canberra, Melbourne, Darwin, Adelaide, Sydney and nation wide. There are many additional accessories you can get to enhance your spa experience including head rests, drink holders, tables, spa benches, step ladders, sound systems, rubber ducks (the most essential accessory you can find for spas!) and much more. Check out the blog for more accessories you can purchase for your spa and different ways to improve your comfort indoors/outdoors etc.